Hours after reversing course and benching Adrian Peterson indefinitely, Minnesota Vikings owner Zygi Wilf said Wednesday that the team "made a mistake" in bringing back their superstar running back following his indictment on a felony child-abuse charge in Texas. "We made a mistake and we need to get this right," he said at a crowded news conference. "It is important to always listen to our fans and the community and our sponsors. Our goal is always to make the decision we feel is right for the Minnesota Vikings ... We want to be sure we get this right." Wilf and his co-owner brother, Mark Wilf, announced their decision around 2 a.m. Eastern after concluding it was best for the Vikings and for Peterson, their All-Pro workhorse who has played his entire NFL career with Minnesota and is accused of injuring his 4-year-old son by spanking him with a wooden switch earlier this year. The organization put Peterson on the exempt-commissioner's permission list, meaning he is off the active roster while he deals with his legal affairs. General manager Rick Spielman would not put a timeframe on when Peterson might be back. "Until these legal matters are resolved, that he will remain on this exemption list," he said. A day-and-a-half earlier, the Vikings said Peterson would rejoin the team after missing Sunday's loss to New England. The backlash to that announcement was significant. The Vikings had at least one major sponsorship suspended. Several prominent NFL advertisers, including Anheuser-Busch, expressed concern about the league's recent off-the-field problems, which include former Ravens running back Ray Rice and the indictment of Peterson. The governor was critical. Fans were angry. Nike, Castrol Motor Oil, Special Olympics Minnesota and Mylan Inc. all severed ties with Peterson. Twin Cities area Nike stores pulled Peterson's jerseys from its shelves and the team canceled an appearance at a children's home. "Nike in no way condones child abuse or domestic violence of any kind and has shared our concerns with the NFL," the company said in a statement to CNBC on Wednesday. "We have suspended our contract with Adrian Peterson." Mark Wilf dismissed the suggestion that Peterson was barred strictly because of sponsor concerns. "Absolutely not," he said. "We value our partners, our sponsors, our community and especially our fans. In the end, it really is about getting it right. We made a mistake." Peterson's agent, Ben Dogra, said the decision was "the best possible outcome given the circumstances." "Adrian understands the gravity of the situation and this enables him to take care of his personal situation," Dogra told The Associated Press. "We fully support Adrian and he looks forward to watching his teammates and coaches being successful during his absence." The NFL Players Association said it had worked with Peterson and the team to resolve "this unique situation. "Adrian Peterson made a decision to take a voluntary leave with pay to take care of his personal and legal issues," the union said. "We support this decision and hope the best for him and his family." Peterson has an Oct. 8 court appearance scheduled in Montgomery County, outside of Houston, on a felony charge of injury to a child. Peterson has taken responsibility for the incident, insisting he meant no harm and alluding to similar punishment he endured from his parents while growing up in Palestine, Texas. Peterson hasn't appeared publicly since the grand jury indictment, but in a statement this week he said he's met with a psychologist and acknowledged there are "alternative ways of disciplining a child that may be more appropriate." Early Wednesday morning, Peterson shared an inspirational, religious-themed message on his Twitter account. The case is expected to take several months to proceed through the court system, so the possibility of Peterson playing again in 2014 appears slim. His future with the Vikings is another matter. He turns 30 next year and will continue to carry a huge salary cap hit in 2015. The Vikings held Peterson out of the 30-7 loss to New England on Sunday to let the situation simmer. 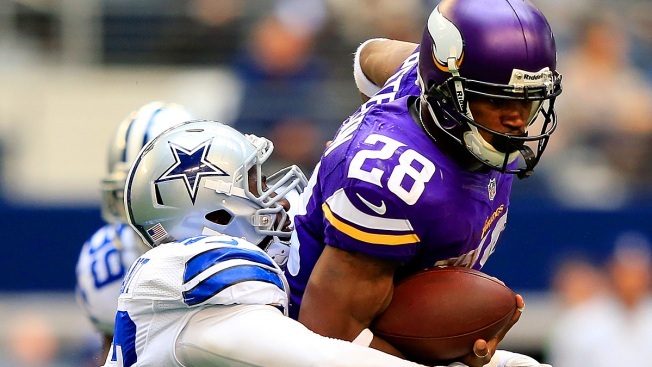 Then on Monday they announced Peterson would rejoin the team and play this weekend at New Orleans. But the Radisson hotel chain suspended its sponsorship with the Vikings and Papa John's pizza considered doing the same. Minnesota Gov. Mark Dayton, who spearheaded an effort to secure $477 million in public money to help build the team a new stadium, and Sen. Al Franken were among the many who called for the Vikings to reconsider their position. The Vikings said they had deliberations with the NFL over the previous two days. They said they informed the league they were revisiting the original decision. Executives were at the team's Winter Park headquarters late into the night Tuesday, discussing how to respond to the avalanche of criticism. It explained the early-morning announcement. "There were a lot of people discussing this, working through it, a lot of different parties in this," Mark Wilf said. "We felt once we get it right, to get it out when we got it right." Peterson has been the face of the franchise since he was drafted in 2007, one of the most popular and marketable stars in the NFL whose All Day Foundation charity is devoted to helping children. But the foundation's website was shuttered Tuesday, at one point posting a message that it "will re-engage after Adrian, his family, and staff have reflected on how the current situation impacts the direction for Adrian's philanthropy."